Watercolor: It's easier than you think ! I have recently moved to the Tryon area of North Carolina. With the move comes new opportunities to offer watercolor classes, workshops, and Art Retreats at my home and studio located beside the beautiful Pacolet River. 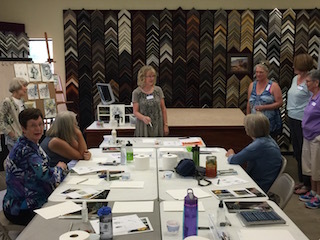 No matter the focus of any given workshop or class I believe in giving simple, step-by-step instructions that include many demonstrations so participants can see how to paint using various watercolor techniques. I know I always learn faster when I can watch someone do what they are asking me to do so I incorporate lots of demo's into my teaching. Then after each demo students will have time to practice each step along with individual guidance and attention from me. The class size is usually limited to a smaller number which also helps to create an easy-going, relaxed, and fun experience. 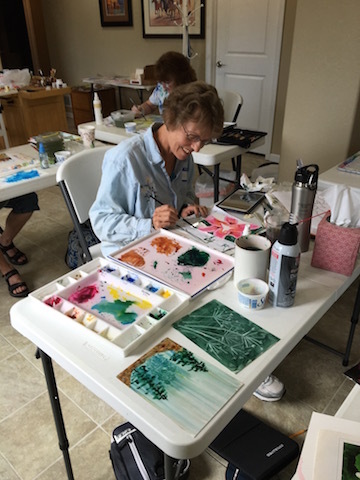 1-day, 2-day, and multi-day workshops are in the process of being scheduled, including residential Art Retreats which will welcome participants to explore and learn new watercolor skills and enjoy the company of others in a retreat setting while staying in our home right on the river (room and board is included in the total price of the Art Retreat) . Watch this space for updates and scheduled workshops. to explore possibilities with you. I am very grateful to have taken watercolor classes with Diane. She is a gifted artist, but more important to me, she is a terrific teacher. The activities that she has developed and her demonstrations are outstanding. Diane is very supportive, encouraging and patient. She gave us the confidence to express ourselves through the wonderful medium of watercolor. Many of us in Colorado took classes from Diane for years. She really created an extended family of painters. Diane was the perfect artist/teacher for my first experience with watercolor! Her warm, gracious manner was encouraging, and her system of breaking down the watercolor painting process was easy to follow. After just two days, I had a painting that's now in a frame - and a newfound love watercolor. 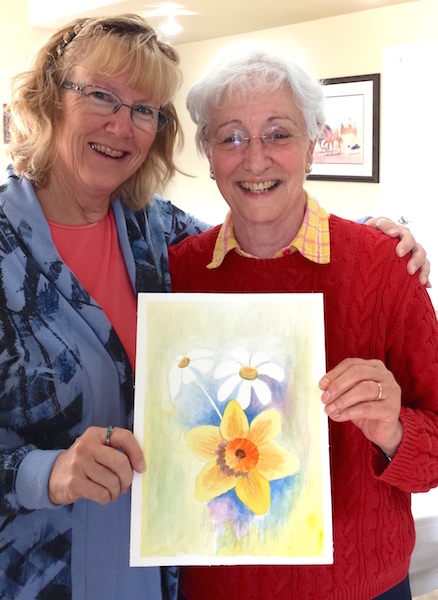 Diane is an accomplished watercolorist and artist. Art for her has always been a lifetime endeavor and love. She shares her knowledge and skills with gentle, encouragement and supports each students to develop their own style of painting. Being in her class has always been a pleasant, fun, and encouraging experience. She has inspired me to further develop my painting and drawing skills. 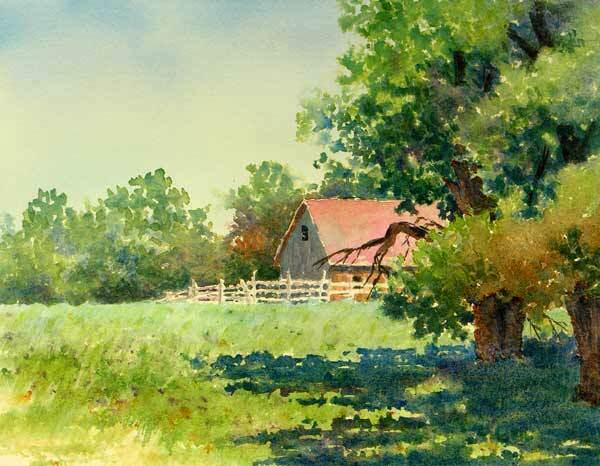 For many years I was hesitant and reluctant to take a watercolor class - fearful of my "end product" being a disaster! All those fears melted away with the first exercise in Diane's Beginner Class. Her skillful design of a simplified progression made for a comfortable journey to the final painting. Diane was with me in each step encouraging me and guiding my paintbrush. She is truly a Masterful Teacher because of her skill, her teaching methods and passion for her students' learning the joy of watercolor. In addition to being an extremely talented artist, Diane is also a very patient and encouraging teacher. She has the ability to be constructive without being critical, and is able to provide individual guidance for each person according to their strengths and struggles. I started taking lessons from her as a beginner and have loved the journey it has taken me on. In Diane's classes we always learned a lot while having fun in a positive and relaxed atmosphere. I would recommend her for artists of all levels. Several years ago I was new in town and rather reluctant to do new things. I emailed Diane for information for info about her classes, and as soon as I got her reply, I knew she was the teacher for me! She was so warm and friendly in her email and I knew she was someone I would enjoy both as an instructor and friend. Her expertise in teaching the basics of watercolor brought out the "buried" artist in me. 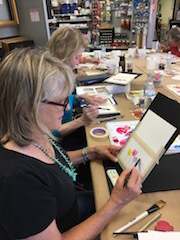 The journey of learning, from the basics on to advanced work with Diane's instruction taught me to both learn a new painting medium...and to have so much fun while doing it!